We undertook our third Bike Walk Lincoln Park intersection evaluation last weekend, this time tackling areas on Halsted in the northwest section of our ward, starting with the crossing at Wrightwood. I was joined by Robert Wallace and Karl Anderson of Alderman Michele Smith's staff, as well as Ryan Wallace (no relationship to Robert), a transportation engineer and observer of our city's streets. Ryan kindly provided many of the statistics and measurements that I include in the post below. The intersection of Wrightwood and Halsted, looking southwest on Halsted. Halsted is an arterial street with around 14,000 motor vehicles passing through at this intersection daily. The #8 Halsted bus stops at Wrightwood Avenue and around 500 people board or alight daily here. In this area, Halsted has condos and townhouses lining it, but also a good number of commercial establishments, including restaurants, bars, banks, chiropractor and dental offices, hardware shops and sundry stores. Wrightwood, on the other hand is a neighborhood street, with mostly residential buildings. The Park West Park is a neighborhood play lot that's only half a block to the east. Two blocks east at Orchard is Alcott School, the neighborhood's public school. So, we noticed a few positive things. All four legs of the intersection have marked crosswalks, albeit in the old-fashioned "two skinny lines" style, and very badly faded. All four legs also have countdown timers for the pedestrian signals. The timing of the signals allows enough time for even a person walking slowly to cross: Across Halsted, a person is given 22 seconds to cross 51 feet, and across Wrightwood, she has 34 seconds to cross about 44 feet. The entire cycle of 56 seconds kept things going at a nice clip, in which no street user had to wait very long for their turn to cross. So what needs to be addressed? The crosswalk markings at the intersection are nearly all faded to nothing, which is hazardous for pedestrians. All the crosswalks should be upgraded to the international ladder style, which is the new standard and much more visible. Stop bars for the motor vehicles need repainting as well. Even though the intersection felt fairly orderly, crash data shows that between the years 2005 to 2011, there were 6 bike crashes and 7 pedestrian crashes (from Chicago Crash Browser). To help pedestrians be as visible as possible, we suggest Leading Pedestrian Intervals be installed, to give people on foot a two-second head start on crossing the street, before motor vehicles begin to make their turns (right or left). The existing bike lane on Halsted is fairly wide, but like most bike lanes currently in Chicago, it disappears completely at the intersection, when a bicyclist is expected to share the right lane with buses and right-turning vehicles. When Halsted receives its upgrade as a Crosstown Route, we expect that there will be a lane that extends to and through the intersection, as is the new standard, and this will increase safety for bicyclists. The southeast corner doesn't have ADA-compliant ramps, and the drop off to the street is very steep. We won't even mention the potholes and puddles in this caption. The east side of the street has very narrow sidewalks, and the curbs are in terrible condition. Parts are broken up, others have drainage issues. On both eastern corners, there are no tactile ramps that help people with visual disabilities become aware of the beginning of the street intersection. The southeast corner by La Bamba is especially ugly: the incline from the street to the sidewalk is too steep for comfort, and far from optimal for people in wheelchairs. The yellow paint by the fire hydrant is almost completely faded. We believe that corner needs a serious rebuild. 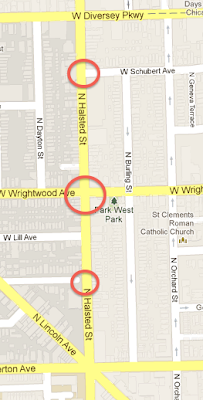 We walked south on Halsted and noted there is a missing crosswalk at Altgeld. Both sides of Halsted have a #8 bus stop here, but there's no marked crosswalk. The west side already has a curb cut, and both sides have no-parking areas conveniently present already. Halsted and Altgeld, looking southwest toward a Children's Memorial building. The east side of Halsted at Altgeld. Bus stops on both sides, but no crosswalk. There's a similar situation to the north, on Halsted at Schubert. There are bus stops on both sides, but no crosswalk. Both sides of the street have many homes and businesses whose residents and patrons would benefit greatly from having a safer and less stressful way to cross here. We note that the crosswalk on the east side of the street, across Schubert, is faded to nearly nothing, and badly needs to be repainted. Crossing Halsted at Schubert with no crosswalk. For both the junctions at Altgeld and Schubert, we recommend installing a painted crosswalk. They should be in the high-visibility international ladder style, of course. An in-street Stop for Pedestrians sign should be located in the center of the street. Also, bright pedestrian signs on the side of the street as shown in the picture below should be installed on both approaches. Ideally, bump-outs should be considered as well, if they don't interfere with the bicycle lane, in order to shorten the distance as much as possible. Signs and arrows like this one on Stockton are visual reminders to drivers that they should stop for people walking. And that is what we saw, and the recommendations we made to Alderman Smith. Did we miss anything? We will continue to hold these evaluations periodically and would love for you to join. Let us know you're interested by e-mailing bikewalklincolnpark@gmail.com or follow us on Twitter @BikeWalkLP. Join our next intersection evaluation "party"!